Touris News, Articles & Blogs | What is the Golden Circle in Iceland ? We are from time to time asked what is the Golden Circle in Iceland? There is a short and a long answer to that question. The short answer would be: It is a route in Iceland that include the scenic highlights of the South West part of Iceland that has been given the name Golden Circle, read further for the longer and more informative answer. Places seen on the Golden Circle Iceland. The name Golden Circle or "Gullni hringurinn" in Icelandic refers to the route from Reykjavik to Thingvellir, Geysir and Gullfoss which are the highlights of the route and back to Reykjavik and make it a circle. The Gold in the name comes from "Gullfoss" which literally means Golden waterfall. Thingvellir have been a national park since 1928 and a UNESCO world Heritage site since 2004. This place has both historical and geological interest. It is where the national parliament was founded in 930 and where it resided until 1798. From a geological point of view Thingvellir are also extremely interesting, the reason being that it is one of the best places to see the power of the continental drift with your one eyes. 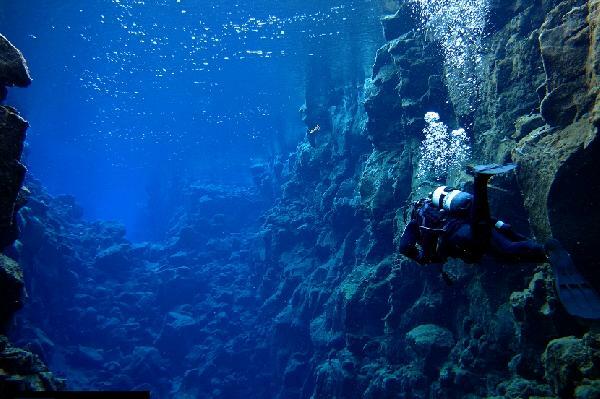 By walking down Almannagjá fault or dive or snorkel in Silfra fissure you will clearly see where the country is splitting apart. Not many know that the word geyser is in fact an Icelandic word. The word derives from one particular geyser in Iceland and you have probably guessed its' name already, it is Geysir! Geysir has not been very active in the past few years but when it was most active it would hurl boiling hot water up to 70 meters (230 ft) in the air. 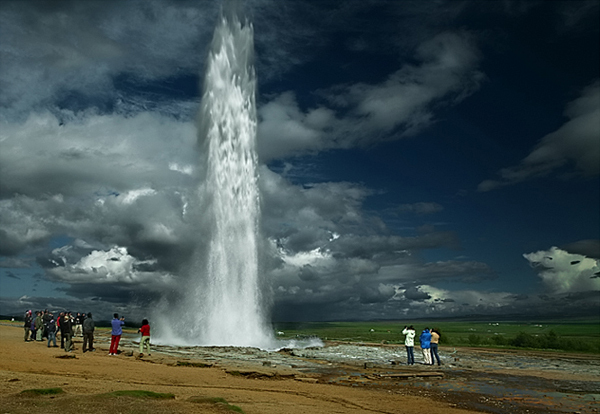 At the Geysir area are lots of different kind of beautiful hot springs but now the main attraction is Strokkur geyser. It is very active and erupts every 5-10 minutes. 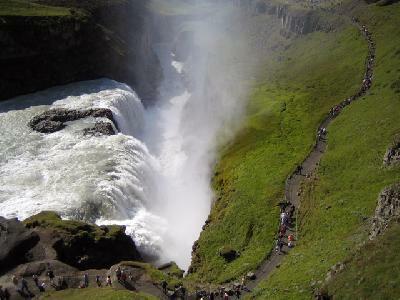 Gullfoss or the Golden falls is a beautiful two tiered waterfall thundering down 32 meters. It is located on Hvítá river (white river) whose source is from Langjökull glacier. Due to its origins the color of the water tends to be from blue-gray to brown. According to Google sightmap the waterfall offers a pretty popular photo opportunity and ranks in the 807th place of world's most photographed places when this is written. 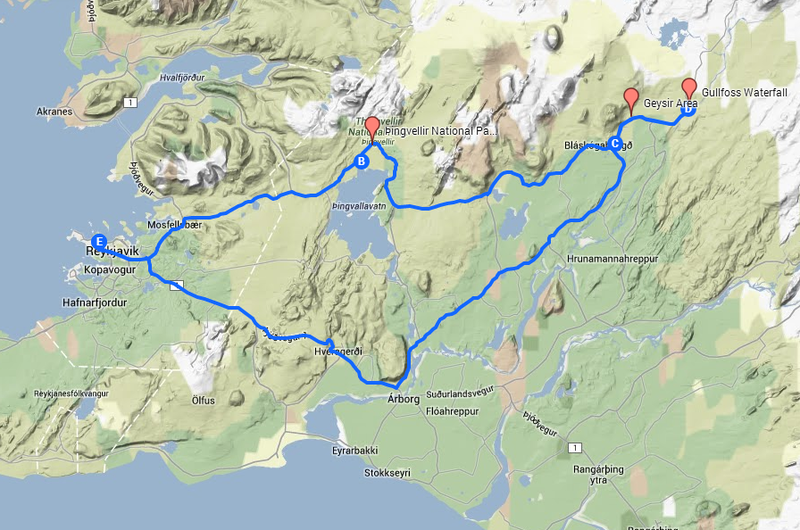 The Golden Circle is 250 km/155 miles in total and here you can find our Map of the Golden Circle in Iceland showing you the three main highlights on the way. There are many tours available around the Golden Circle in Iceland and it is included in all of our self drive tours itineraries. If you are situated in Reykjavik and would like to do a guided day tour our two most popular Golden Circle tours from Reykjavik are the Golden Circle Classic which is a bus tour and the super jeep version of the same tour the Golden circle by super jeep and Langjökull glacier. As the name suggests you travel by a big 4x4 and get to go on Iceland second biggest glacier, Langjökull with the added option on going on a snowmobile tour. We also offer several other tours to the Golden Circle and combination of Golden Circle tours with activities such as whale watching, Blue Lagoon, horseback riding and city sightseeing to name a few. There are too many excursions to name them all here in this short article but you can see our wide variety of day tours to the Golden Circle here. We hope this answers the question of what is the Golden Circle in Iceland ? if you have any questions regarding our trips or services please send us a inquiry or chat with us online through our main page.